It’s nearly Halloween, and it turns out that children’s hunger for age-appropriate scares rivals their taste for those elusive, full size trick-or-treat candy bars. Mmmmmm … chocolatey age-appropriate scares. Well, we’re here to help stave off starvation with these new and old school viewing options. Hayao Miyazaki – often called Japan’s answer to Walt Disney – shares the sweetly magical tale of a budding young witch. Fun adventures befall the little witch-in-training, who becomes a baker’s courier to gain broom-flying skill. Kids will like the holiday feel, the cat and the hijinks with no worry of big scares. This film is so utterly enjoyable, charming, and silly that you almost miss the true ingenuity and craft in the animation itself. British placticine duo Wallace – inventor and cheese lover – and his silently worried dog Gromit, take on the bunnies upsetting town gardeners. But things go all Halloweeney on them. This is the kind of film that begs to be scanned for its clever details (the town barbershop is called A Close Shave, for instance), but it’s the unselfconscious, innocent comedy and remarkable animation that make the film a stunning success. Wallace & Gromit belong in the highest echelon of doofus and silent sidekick comedy teams, and everyone in your family has reason to see their first full length feature. Honestly, this is not one of Pixar’s greatest efforts, but a second tier Pixar film still beats the pants off most anything else you and your kids might watch. The animation is stunning. (Who doesn’t, right now, want to have a fuzzy blue Sulley doll?! You? What are you, a sociopath?) A couple of best buds living in Monstropolis have to keep it under wraps that a child has infiltrated the city. She’s a serious risk of contamination – this is a real danger, actually, because children are filthy germ bags. And they’re often quite sticky. Pixar knows this, and alerts us to the potential epidemic via fuzzy monster characters. In stellar black and white, Tim Burton animates the tale of a quiet young scientist and his undead dog. Odes to the classics of horror will entertain the parents (maybe even grandparents) in the audience, but the lovely boy/dog friendship, quirky school kids, and science-related peril will entertain the kids. Plus, Mr. Rzykurski (Martin Landau) is the most spectacular science teacher ever, as depicted in his speech to parents at the PTA meeting: Ladies and gentlemen. I think the confusion here is that you are all very ignorant. Is that right word, ignorant? I mean stupid, primitive, unenlightened. 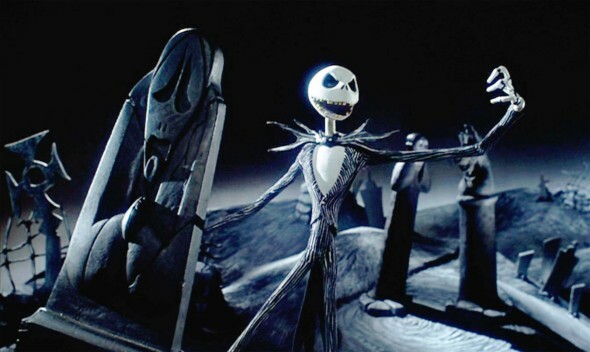 Back in 1993, Tim Burton produced the classic goth holiday extravaganza The Nightmare Before Christmas, having handed over his own sketches and story to director Henry Selick and the world’s coolest stop-action animators. Burton’s team, including Danny Elfman on tunes, assembled a lightheartedly macabre fantasy that artfully yet cataclysmically mixed America’s two most indulgent and excessive holidays. It was inspired. The first animated film Tim Burton directed is equal parts wholesome and gruesome, somehow effortlessly combined. A nervous groom practices his wedding vows in a forest, unwittingly awakening a bride murdered on her wedding night. She misunderstands and accepts is promise of love. The reluctant groom is ushered into the afterlife, which is more like a cool blues club than a cloudy resting place, where he is welcomed by a delightfully grisly cast of characters. The comedy is clever, the bride’s heartbreak is often genuinely poignant, and the rotty flesh is just as natural as the pre-wedding jitters. It’s no Jack Skellington, but it is close. This one is likely to scare little ones, what with its super creepy sideshow circus backdrop, scary old man and a house that actually eats people. Loads of endearing and interesting characters fall upon the kinds of everyday scares that bloom in a child’s imagination. Well written, honestly spooky, and eventually quite heart tugging, Monster House was a surprise Oscar nomination back in ’06, and is still an underseen Halloween gem. Coraline is a two-sided cautionary tale. For kids wishing for more attentive parents, be careful what you wish for. For parents disinterested in their tweens, danger lurks and lures your girls. Adapted for the screen and directed by Henry Selick (Nightmare Before Christmas), Coraline offers darkly magical visuals, quirky and creepy characters, and a surprisingly disturbing storyline. The film is clever and goth-gorgeous, but may be a little too creepy for kids under 10. “I see dead people” takes on new legs with this animated tale of the supernatural. ParaNorman celebrates cinematic horror with the story of a little boy whose closest buds are the goofy new kid and his own long-dead grandma. But Norman’s gift of seeing ghosts proves pretty beneficial when some witchy chicanery threatens the whole town. Plus, big props for including a gay couple in a family-friendly flick. It’s Asia – to the Extreme!